Welcome back to blogging! I know its been awhile. We have been having lots of fun lately so we decided to fit the last 6 weeks into a post that will take you 6 minutes to read. Kenzie loves the window in our front room. She climbs in there and just beats on the window. Lots of fingerprints for me to clean! Such a happy girl that loves the camera! She is her mother's daughter! 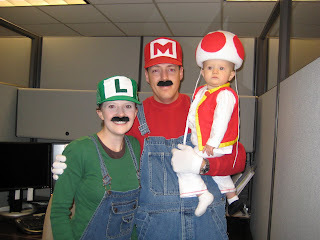 For Halloween we dressed up as Mario, Luigi, and Toad. Aren't we cute! We actually won the best family costume at Jordan's work party! We got an electric toothbrush... woot woot! Mario and Toad posing for the camera. She didn't like keeping the hat on very much but thats ok. She was still cute. Trick or Treating for the first time. Notice her basket is an easter basket! Thats ok :) She'll never know. My name is Mater... its like Tamater without the Ta. Kenzie loves her balloons. Every time I go into a store where there are balloons she points and gets so excited! Sometimes I just can't resist when they are a dollar. This want the first part of November. Jordan had a conference in Texas so Kenzie and I went to Grandma and Grandpas for the week. We had so much fun! 3 generations... do we look alike? Happy that Daddy is home. Every morning she likes to help Daddy shave. She even makes a buuz sound! Kenzis first time coloring with crayons! How fun is that! Happy Birthday Jordan!!!!!!!!! Poor guy had to drive the whole day on his birthday, but he was a trooper and ate at Subway for his birthday lunch. Then Grandma fixed his favorite... tacos and cheesecake for dessert. We didn't have candles so he got a big one! Happy birthday! We love you so much! And last but not least... Happy birthday to our sweet little girl. This is her by her cake. Ican't believe how fast it all went! We had such a great year! Thanks for making us so happy! Kenzi finally warmed up to Grandma and Grandpa a little bit. Kenzi was eating a blueberry bar and she rubbed it on her face. It kinda looked like she got into a fight. Kenzi's cake up close. Not to bad for the first one! Kenzi after she opened all her presents! Daddy helped! Josh and Nicole brought a little present over. She had such a pretty bow in her hair! Grandpa reading Kenzi a birthday story. She just loved this book! Grandpa put Kenz in a box and she was having so much fun! Crazy crazy! Thank you to everyone who has helped with Kenzi! She is such a special girl and we love her so much! It's been a great year! I loved all the pics. Great job on the cake! You'll definately have to show me how to use fondant. Happy Birthday Kenzie! Yay! A new post from you! I have missed you but it looks like you have been having lots of fun!